For those of you who anticipate these annual food fests with your nearest and dearest with the enthusiasm of a dental patient scheduled for root canal—have I got a post for you! Though some of us may be reluctant to admit it, holiday dinners with the clan can be an ordeal, and not just for the digestion. Sure, we love our folks, but maybe not all at once. Smaller doses might be preferable. Or maybe long distance and Skype will work out better. Me, I tend to burrow like a hibernating bear at this time of year, sending out growls that I’m not to be disturbed till Groundhog’s Day. It’s not that I’m (entirely) anti-social. It’s just that sometimes I think Garbo had the right idea. Well, for those few (those very few) solitary misanthropes out there, whose idea of Turkey Day is to cuddle up with a few cinematic turkeys (check out my posts here and here), here’s a rundown of some celluloid feasts that show what a challenge eating with the folks can be. Or what a challenge it is to eat, period. So, as you tuck into your bird and raise a toast to Hearth and Home, take a gander at the following illustrative clips. Just what’s needed to brighten up the festivities. Or maybe not. No survey of food in film can be complete without the Three Stooges. For no other cinematic team was an encounter with edibles such a test and a trial. Their confrontations were always a fight to the finish; need I add that the food always won? I earlier wrote here about Curly and his peculiar (and how!) method of preparing a meal. In the clip below, we look at how Curly attempts to consume a meal, in this case a bowl of soup. Sadly, there’s no contest here; the soup has it all over the sap. Still, I must applaud Curly’s efforts. Though the battle is unequal, he goes down fighting. It’s a combat worthy for a future Homer to compose an epic. I’ll even give you a title: call it The Curlyiad. I suppose there are worse things in life, but I really hate eating with strangers. It’s more than trying to think of topics to talk about; it’s the whole self-consciousness-about-table-manners thing (am I slurping my soup too loudly? Curly might have some advice about that). In the following clip from the 1964 film Dear Heart, Glenn Ford deals not only with the embarrassment of sharing a table with a stranger in a strange restaurant, but must contend with sarcastic wait staff and a lack of seating room. His one saving grace is the presence of the great Geraldine Page, who’s so warm, funny, and endearing here, she could make the most dreaded dining situation bearable. The sequence is capped with a table joke that could have been invented by Frank Capra or Preston Sturges (though the film’s director was Delbert Mann). No, I’m not referring to Edvard Munch (Munch at least wasn’t being served dinner). The following sequence, which was directed by Frank Capra (from 1938’s You Can’t Take It With You) captures perfectly that I-just-want-to-crawl-under-the-table feeling when you’re dining in public and the situation gets a bit…fraught. Its charming stars, James Stewart and Jean Arthur, ace the rhythm perfectly. Does anyone have timing like this anymore? For those of you thinking of dining out for the annual turkey and pie rations, this clip from Never Give a Sucker an Even Break might give you second thoughts. W.C. Fields, master of the cringe, the askance glance, and the resigned shrug, takes on the inimitable Jody Gilbert in the mid-20th-century small-town-Americana version of jousting with dragons. As I wrote earlier here, Fields was unique among the great comics, with a view of middle-class American life as a No-Man’s Land of nags, scolds, nitpickers, pettifoggers, and pompous asses; against which the helpless, hapless, and hopeless can only counter with small gestures of rebellion that usually fall flat (like lighting a cigar still wrapped in cellophane). It’s comedy meant for the curmudgeons among us—such as those of you now reading this post. Did Mickey Bring The Finn? She’s a widow with eight kids; He’s a widower with ten. (That’s enough offspring to set up two baseball teams.) They’re attracted to each other but wary of commitment (it’s not like they need more kids…). But He invites Her to dinner anyway to meet His brood, who resent Her getting involved with Him. So, unbeknownst to both Her and Him, these Spawn from the Nether Regions decide to spike Her drinks with strong liquors and then watch the results. If this be hospitality, I’ll take the company of wolves. He and She are, respectively, Henry Fonda and Lucille Ball, starring in the 1968 film Yours, Mine and Ours. (They had last appeared together in 1942’s The Big Street, in which she was a heartless chorus girl and he a worshipful busboy. Times do change.) If I were an acting teacher, I’d insist, no, I’d order my pupils to watch Ball’s performance in this scene. She’s wonderful. Getting drunker by the minute and without knowing why, she veers between confidence and confusion, blurting out her feelings while she laughs and cries, often both at once. She’ll make you, too. It’s a masterly performance, right from the heart. The dinner may be hellish but Lucy is sheer heaven. One of my fondest Thanksgiving memories is watching Laurel and Hardy every fourth Thursday in November, in 1934’s March of the Wooden Soldiers (AKA Babes in Toyland). That was in the BHV (Before Home Video) Era, so viewing the movie at the scheduled hour was necessary. What matter; those were halcyon times. For me, Thanksgiving still isn’t complete without the boys. They’re always welcome at my table. Of all the L&H shorts, Twice Two from 1933 may be the most weirdly incestuous of them. The boys play themselves and also their sisters, each of whom is married to the other—sister to other brother, that is, not to themselves. Maybe I haven’t made that clear, but the videos will. There are three brief clips, in sequential order, giving you an idea of what dinner in this loving family home is like, and I wouldn’t wish it on my worst enemy. Once when a group of us were dining at a restaurant, we asked the waitress what was on the dessert menu. She rattled off a list of goodies, including, as I recall, “some pies.” She wasn’t more specific about them, so I can’t say what they were. Though it did make me wonder. Since dinners often conclude with “some pies,” I’ll end so here. And who better to serve up the tins than the Three Stooges? More needn’t be said. Bonus Clip: Can’t get enough pie? Always room for some more! Enter your email address to subscribe to Grand Old Movies and receive email notifications of new posts. So Just Who Are We? We're two cats and a human who obsessively watch old movies and write about them. We'd write all the time, only cats can't type. © Grand Old Movies, 2019. Unauthorized use and/or duplication of this material without express and written permission from Grand Old Movies’ author and/or owner is strictly prohibited. Excerpts and links may be used, provided that full and clear credit is given to Grand Old Movies with appropriate and specific direction to the original content. 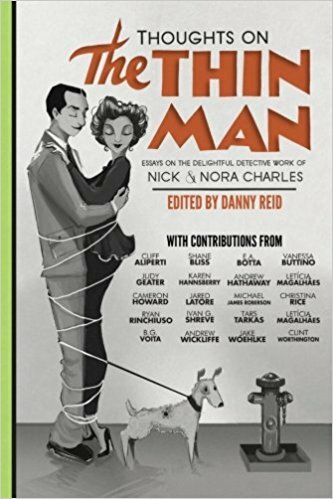 Click this link to purchase 'Thoughts on The Thin Man' and check out my essay on the role of Mrs. Asta in the Thin Man film series.